Last year's Kinetic FFT 175 was the best selling Pro Kennex Racquet we had right out of the gates in 10 years. This year they are taking it up another notch with their Kinetic Counter Balance System and decided to once again go with a 175 gram weight and add a 165 gram weight racquet as well. 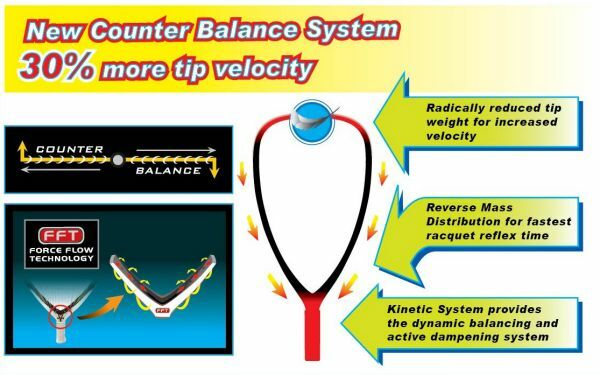 The Kinetic Counter Balance System is explained below. Once again the #1 player in the world and possibly of all time is playing with the high end Pro Kennex line - maybe you should too! These are available in the smaller 3 5/8 grip size only. This has been the best racquet I have ever purchased. I have strung it at many tensions (28, 35, and 38 lbs) and it has played well at all of them. I feel that since using this racquet my game has improved significantly. I purchased this racquet in 2016 and I play about 10 hours each week. Even after several wall and racquet collisions (hard collisions) this racquet shows no sign of giving up. I recommend this raquet to anyone looking to improve their game. I will continue to use this racquet until the day it breaks (if it ever does). A unique space age blend of treated Spiral Tech Graphite and High Modulus Graphite combined with Nano Epoxy. Results in exceptional dampening qualities and delivers the needed strength and power. 1" (22" total) longer to increase the hitting leverage of the racquet for faster head speed and increased power.